Green Bites Cafe is located in space that used to house Zino’s, an establishment that, to put it mildly, left a lot to be desired. When I saw a new sign out front I wondered if the proprietors had simply elected to re-brand, hoping to fool your average sandwich enthusiast. I am pleased to report that is in no way the case, and Green Bites Cafe is a brand new establishment. On top of that, I’m even more pleased to report that they make a delightful sandwich. The Lemongrass Chicken is a lemongrass marinated chicken breast, with pickled jicama, carrots, herbs and a special sauce. Wheat bread was suggested, which was just fine by me. The lemongrass flavor is subtle, and the pickled jicama is a wonderful flavor and crunchy bit of texture. The secret sauce had a hoisin sauce sweetness to it, but not so sweet as to overwhelm everything else. The chicken could have been a bit less dry, but the only place I’ve ever seen that can serve a moist chicken breast all day long is the late Crosby Sandwich Connection, so I don’t hold it against most places. What really made the sandwich sing, though, was that everything was fresh, just delightfully fresh and bright and vibrant. It may seem like things only go one way in this world of ours, but Green Bites Cafe stands as proof that sometimes the old rubbish is swept away and something lovely grows in its place. 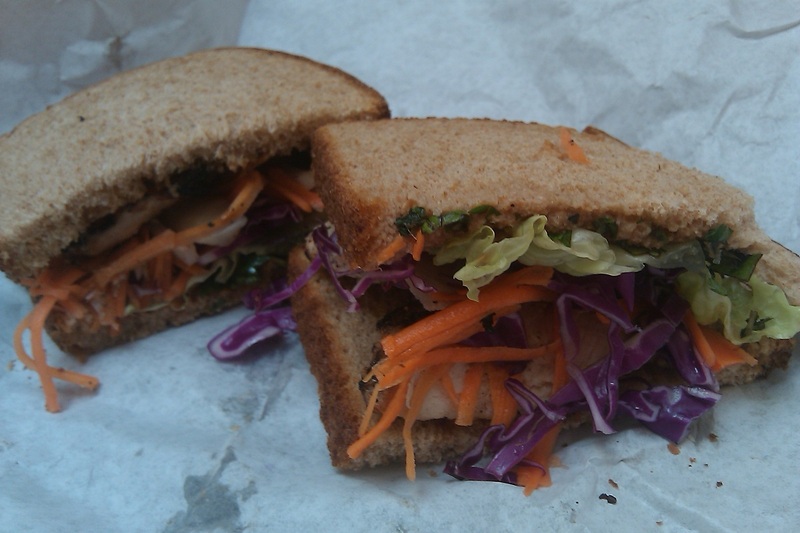 This entry was posted in Sandwich Reviews and tagged Chicken, Reviews by Pete, San Jose, Sandwiches I Have Eaten, Sandwiches Made For Me by Pete. Bookmark the permalink.